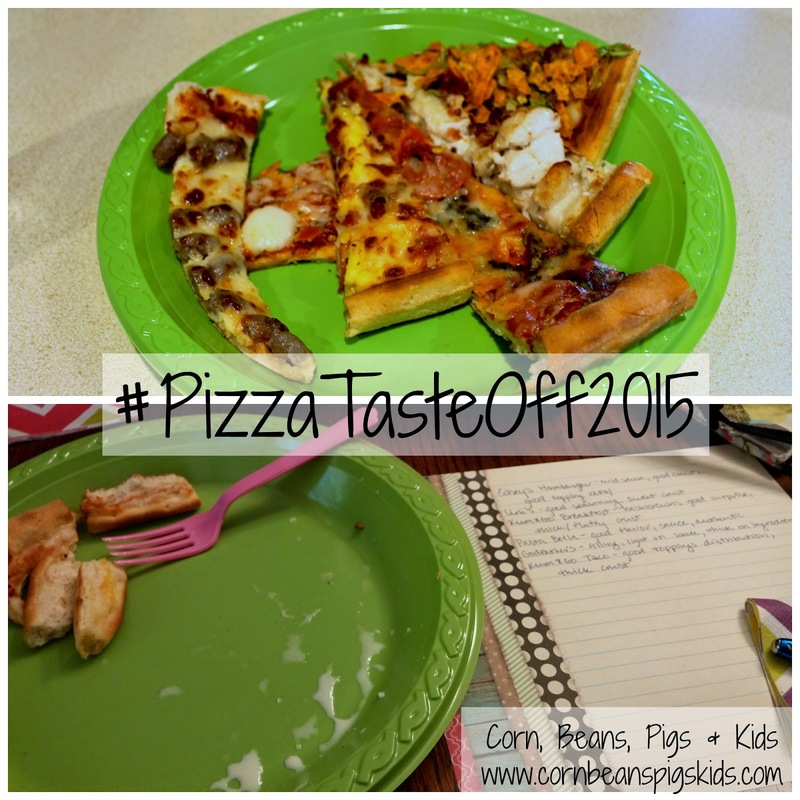 Corn, Beans, Pigs and Kids: #PizzaTasteOff2015 - Who has the best pizza in North Iowa? #PizzaTasteOff2015 - Who has the best pizza in North Iowa? It's Friday! Which means it is pizza night at our house, but I celebrated early with the North Iowa Bloggers on Wednesday night by participating in the #PizzaTasteOff2015. So what is/was the #PizzaTasteOff2015 you might ask? 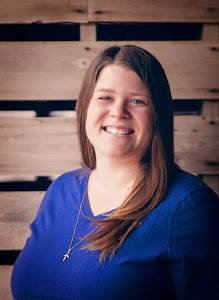 Well, it all started a few weeks ago when one our North Iowa Bloggers, Beth Ann, admitted that she had never had Casey's breakfast pizza on Twitter. Now, if you are from Iowa or the Midwest you might be wondering how could anyone living in Iowa never had Casey's breakfast pizza - afterall Mila Kunis even mentioned that it was her favorite "junk" food earlier this year. Well, Mila or Casey's weren't the first to respond to Beth Ann's tweet, instead it was Kum & Go, Casey's competitor, and they said she needed to try Kum & Go's instead. So after some tweeting back and forth as a group with Kum & Go, Casey's and even Godfather's in Mason City, before we knew it we had several donated pizzas to determine who the true pizza king was in North Iowa, henceforth becoming the #PizzaTasteOff2015. 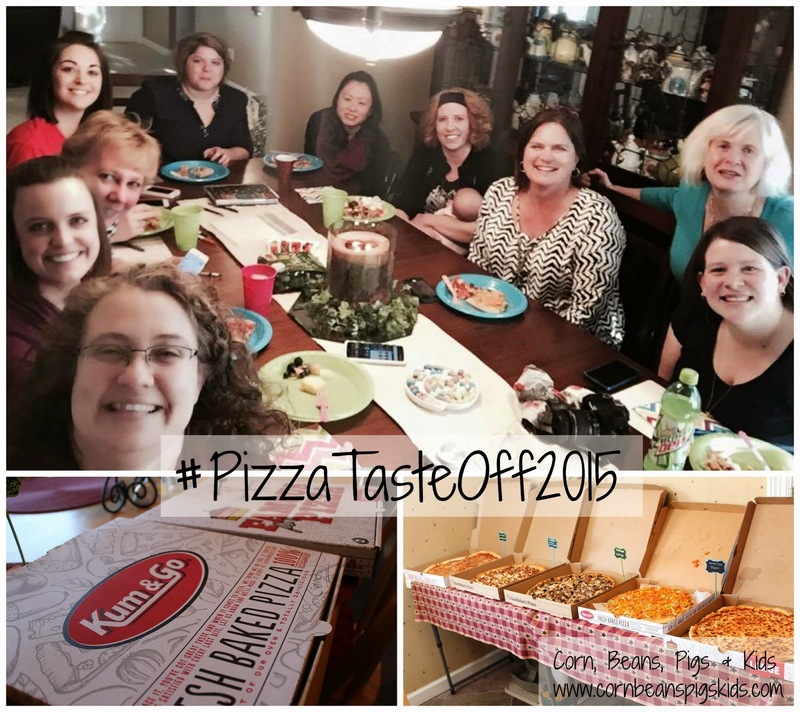 There were nine pizzas that were apart of the #PizzaTasteOff2015 on Wednesday: Casey's Cheese, Casey's Hamburger, Kum & Go Taco, Kum & Go Sausage, Mushroom, Onion and Black Olive, Kum & Go Breakfast, Godfather's Chicken Bacon Ranch, Godfather's Combo, Pasta Bella Italian Restaurant's Margherita, and Udi's Gluten-Free Margherita. (A special thank you to Casey's, Kum & Go and Godfather's for donating all of their pizzas.) Now, to start off, I will have a full disclaimer, I didn't try every pizza. I am not a fan of olives and saw no point in having a slice of cheese. But I did try six of the pizzas. I asked my Twitter followers what criteria I should judge the pizzas on and they suggested sauce, flavor combination, crust, proper ingredient ratio, general appearance and overall experience - so I took all of those into suggestion as a pizza critic for the night. And I must have had a similar experience as everyone else because my top three pizzas were the top three voted pizzas from the group. First place (and my first choice) went to a local Italian restaurant, Pasta Bella, with their Marherita Pizza. This pizza had great flavor and I loved the seasoning and tang of the sauce. I felt like it was the most "authentic" pizza in the taste test. Whenever I've been to Pasta Bella I've always gotten a pasta dish but I'm going to have to check out their pizza menu next time! 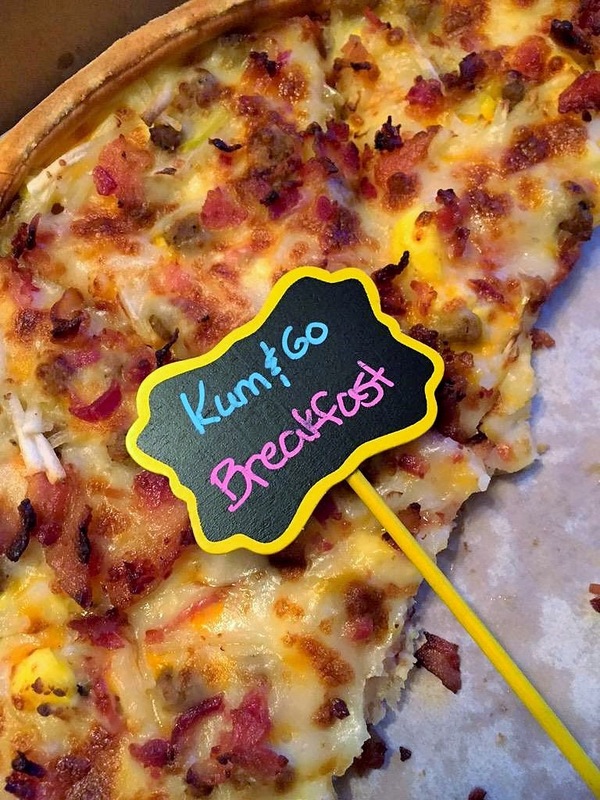 Second place (and my third choice) went to Kum & Go with their Breakfast Pizza. Now, I will admit, being a fan of Casey's Breakfast Pizza, I had some doubt on how Kum & Go's could ever stand up to the classic Casey's version, but it was good! With its nice, thick and fluffy crust, paired with a good surprise of string hashbrowns as one of the toppings, it was a very filling pizza. Another reason I loved Kum & Go's pizza was because of the service we received from both corporate and our local station. They all went out of their way to make the North Iowa Bloggers experience a positive one. Third place (and my second choice) went to Godfather's of Mason City with their Chicken Bacon Ranch. This was another filling pizza as it had a thick crust and was loaded with toppings. I also loved that there was a lot of cheese on this pizza, because who doesn't love a nice helping of cheese on their pizza, right? One of the North Iowa Bloggers, Loni, was very passionate about Godfather's you could say... 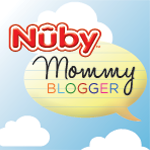 Check out this video to fully understand. In the end, we had a lot of great food, great conversations and a lot of fun. And we think we'll need a second installment of the North Iowa Bloggers #PizzaTasteOff2015 because we've already heard from the local Pizza Ranch and Little Chicago that they need to be in the next challenge. So what is your favorite pizza place? Who do you think should be apart of our next #PizzaTasteOff2015? What do you look for in a good pizza? Remember to Comment for a Cause!